The ‘flagellation effect’: Can pain compensate for immorality? Many religious traditions have pain rituals, and some of them are grotesque. Some Shia Muslims whip themselves with zangirs, whips made of knife blades, until their backs are red with blood. In the Hindu ritual of kavadi, believers use meat hooks and skewers to pierce their legs, face and tongue. In Christianity, “mortification of the flesh” dates back to the original teachings, and practices range from wearing hair shirts and chains to various forms of self-flagellation, even self-castration. Pain purifies. It atones for sin and cleanses the soul. Or at least that’s the idea. But is there any psychological truth to this notion? Theological questions aside, can self-inflicted pain really alleviate the guilt associated with immoral acts? Psychological scientist Brock Bastian of the University of Queensland, Australia, decided to explore the psychological consequences of experiencing bodily pain. He and his colleagues recruited a group of young men and women and tricked them into thinking they were part of a study of mental and physical acuity. Under this pretense, they asked them to write short essays about a time in their lives when they had ostracized someone; this memory of being unkind was intended to prime their personal sense of immorality—and make them feel guilty. A control group merely wrote about a routine event in their lives. Afterward, the scientists told some of the volunteers—both “immoral” volunteers and controls—to stick their hand into a bucket of ice water and keep it there as long as they could. Others did the same, only with a soothing bucket of warm water. Finally, all the volunteers rated the pain they had just experienced—if any—and they completed an emotional inventory that included feelings of guilt. The idea was to see if immoral thinking caused the volunteers to subject themselves to more pain, and if this pain did indeed alleviate their resulting feelings of guilt. And that’s exactly what the researchers found. As reported on-line in the journal Psychological Science, those who were primed to think of their own unethical nature not only kept their hands in the ice bath longer, they also rated the experience as more painful than did controls. What’s more, experiencing pain did reduce these volunteers’ feelings of guilt—more than the comparable but painless experience with warm water. Why would this be? According to the scientists, although we think of pain as purely physical in nature, in fact we imbue the unpleasant sensation with meaning. Humans have been socialized over ages to think of pain in terms of justice. We equate it with punishment, and as the experimental results suggest, the experience has the psychological effect of rebalancing the scales of justice—and therefore resolving guilt. Whether or not one believes that God works in mysterious ways, it seems that pain is the embodiment of atonement. Wray Herbert’s book, On Second Thought: Outsmarting Your Mind’s Hard-Wired Habits, was recently published by Crown. Excerpts from his two blogs—“Full Frontal Psychology” and “We’re Only Human”—appear regularly in The Huffington Post and in Scientific American Mind. 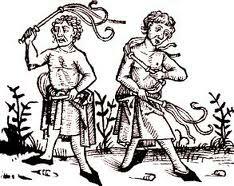 News > Full Frontal Psychology > The ‘flagellation effect’: Can pain compensate for immorality? I am inclined to agree with the conclusion of the scientists. After committing immoral acts, I underwent a catharsis of sorts that involved self-inflicted pain. I am unsure if my “scales of justice” were realigned to equality, but the act began my path of self-improvement I currently walk now. This is why I believe physical pain helps cleanse the mind as it really is the embodiment of atonement. I have recently started self Flagellation to the point where bleeding occurred on my back and chest. I have no idea why i started doing this but the relief I got was immense. It has been two days since I did this I wanted to do it again today but decided to heal a little first. The relief was immediate while i was performing it which caused me to continue I whipped by back and chest over 100 times each. I can still feel a little pain and it brings gratification. Psychological Science’s Human Clientele: Beneficiaries or Victims?